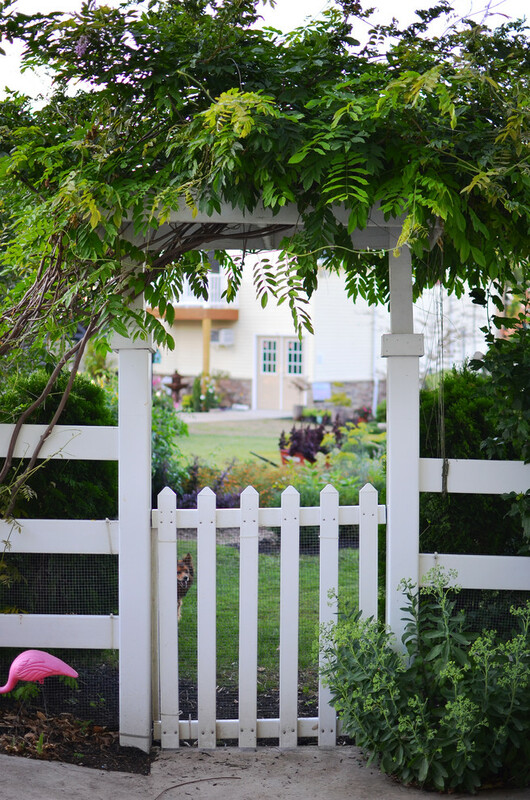 Fences cannot only secure the space and mark the boundaries, they can also frame the home landscaping, front yard, back yard, patio, and even porch. Aesthetically, they are commonly used as the highlights to home landscape designs, being the direct focal points of frontage. Selecting one that fits your personal style and need. Design is crucial yet function be the most crucial one. 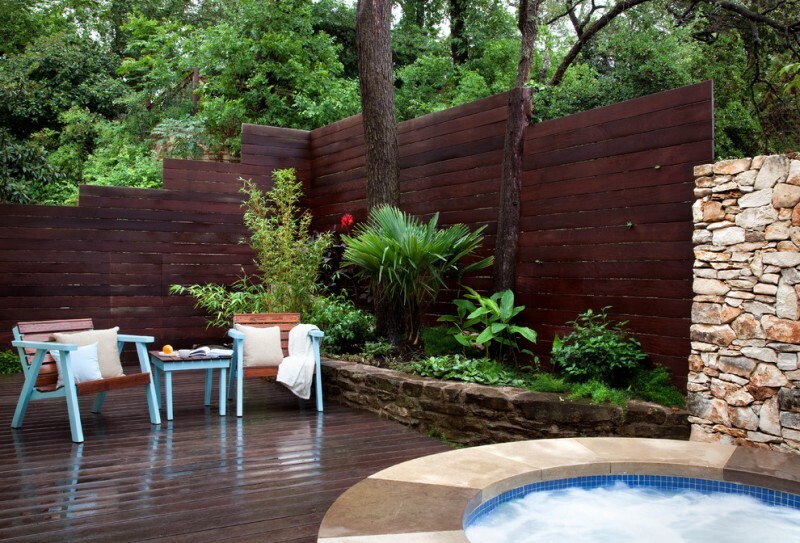 The followings are 50 best decorative fencing ideas that may give your inspiration. Let’s review one by one. Simple and classic! The design exposes the traditional fencing style with distinctive details. 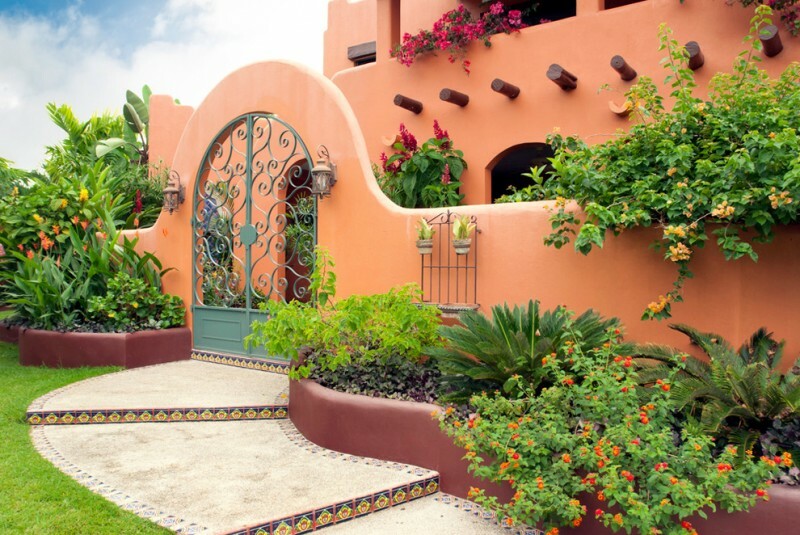 You never be wrong to choose this one for your eclectic home landscaping design. Lightweight metal nets are included between the individual fence, giving a maximum security. 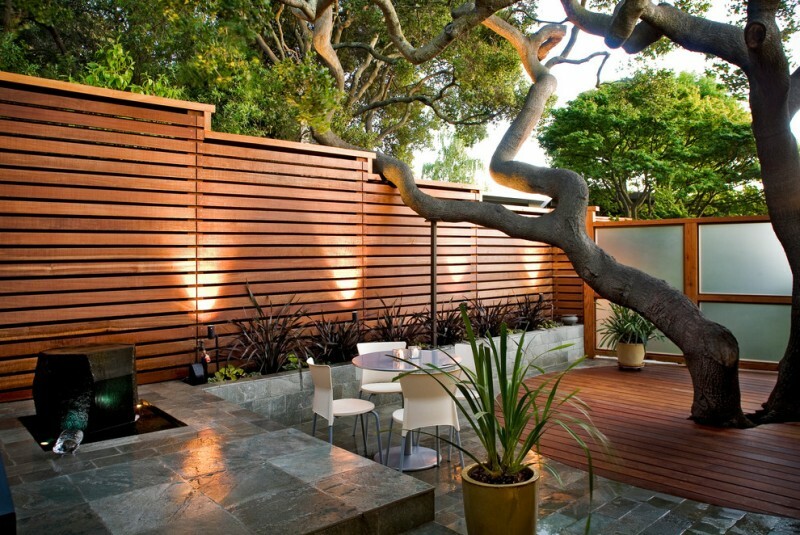 A modern landscaping idea supported with semi-privacy fencing design. The fences are built from stainless steel wire rails & wood-vinyl posts. The wires are horizontally installed on dark-toned wood vinyl posts that powerfully protect the inner area. It’s always amazing to find such a beautiful fencing design. The fences are the arranged stones and they perfectly fit the home exterior. The materials bring rustic appeal. Cedar gate and fence idea in semi-height level. 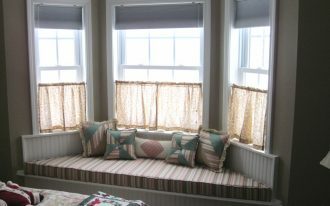 Both are intentionally made in shabby for an antique and old look, being similar to home exteriors. 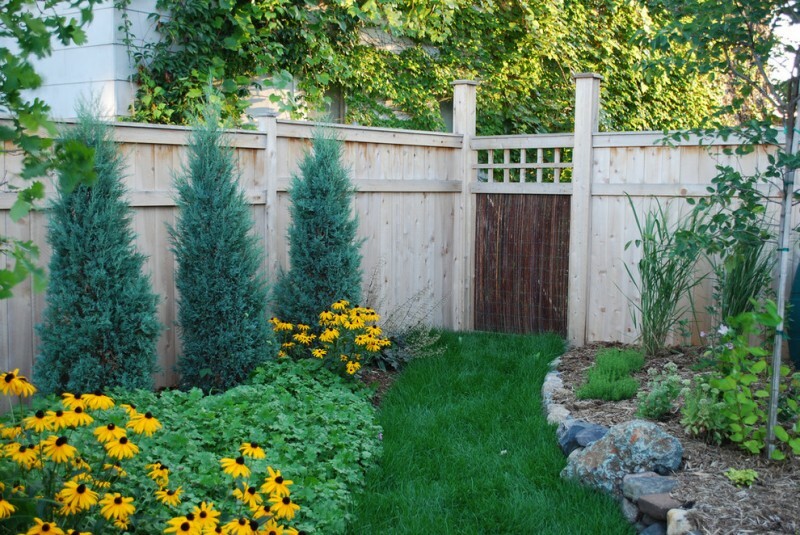 Low-level wood fencing idea for transitional landscaping designs. The design simply keeps exposing what is in inside and outside. With this fencing installation, you’ll easier to enjoy broader views outside from your home. Lattice fences for maximum privacy. This choice really fits the classic patio where you need much privacy. 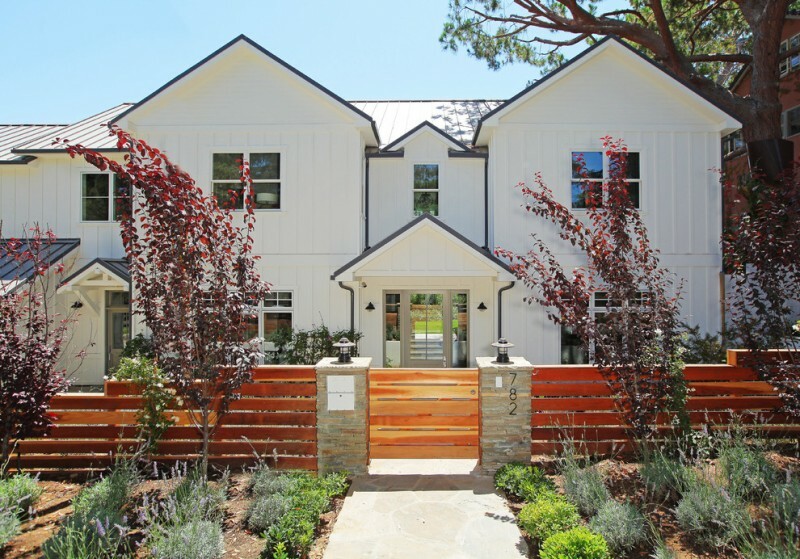 Clean-look fencing idea for farmhouse exterior with modern flavor. 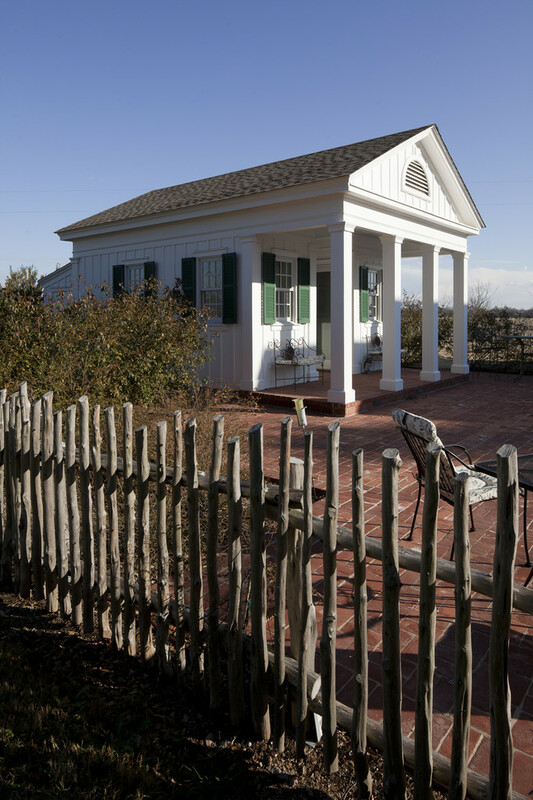 The fence posts are designed in back of fences’ front side to create clean and simple. Such design also doesn’t break soft texture of each horizontal individual fence. 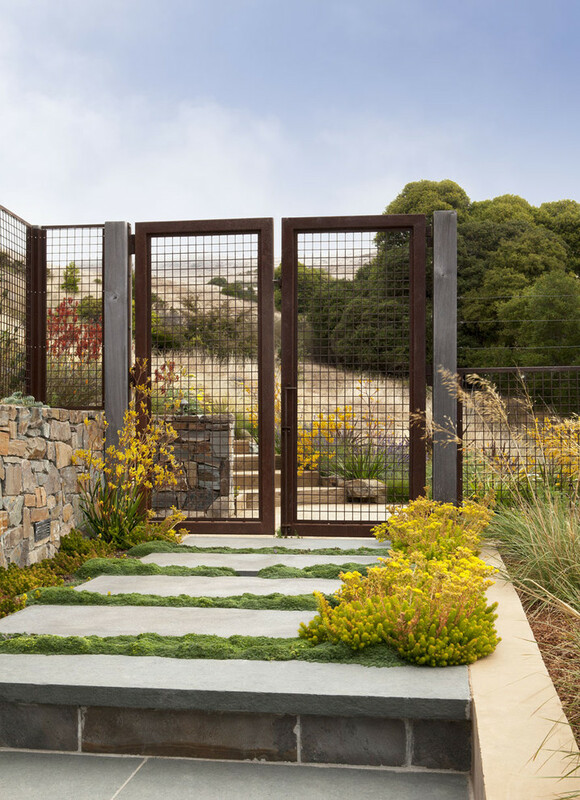 Rough texture becomes the highlight and the fences’ arrangement also attracts us of all with its casual look. Each individual displays small-sized natural tree trunk, so they as if an arrangement of tree-trunk fences. This concept is quite unique and matched for a country style landscaping. A decorative & functional fencing idea for dog houses. Give high security for your dog house just with such a simple stainless steel-wired fences system with wood fence posts. This is another fence system matching the house. 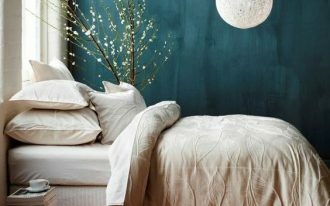 It becomes the most exposed feature due to its powerful paint color that really evokes the plants look. 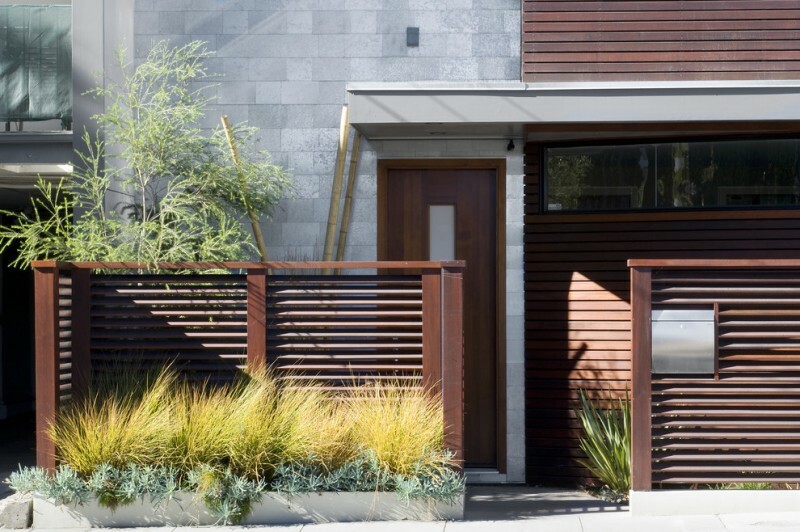 Simple minimalist fences for contemporary front yards. The fences are so stunning but need good maintenance and treatment. They should be replaced periodically with lots of work. 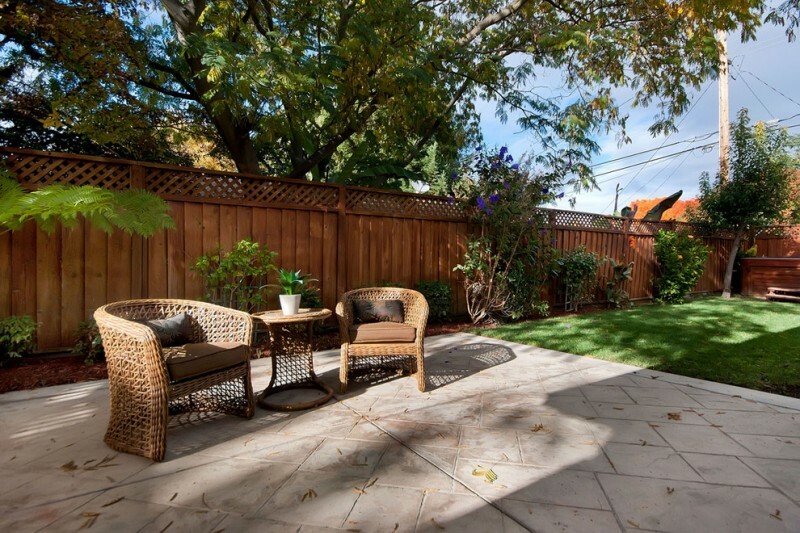 The pros are such kind of fencing idea offers great privacy, clean lines, and high-end look. Probably white can be too dazzling on our eyes, this elegant grey-painted wood fencing system is much better then. Grey and other neutral-bold tones are able to be contrast to the background and landscape, assisting to create more stunning views inside the fences. Wanna try this fence idea? Wood fencing idea without finishing. 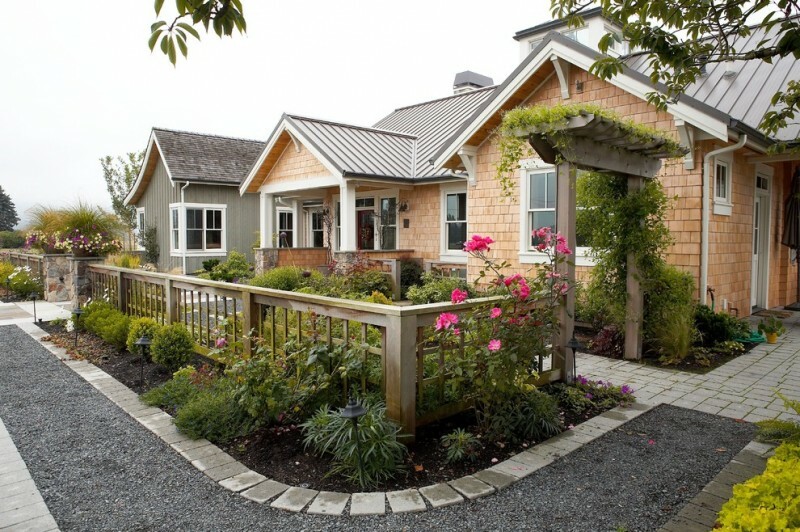 It fits the urban-style landscaping and exterior. 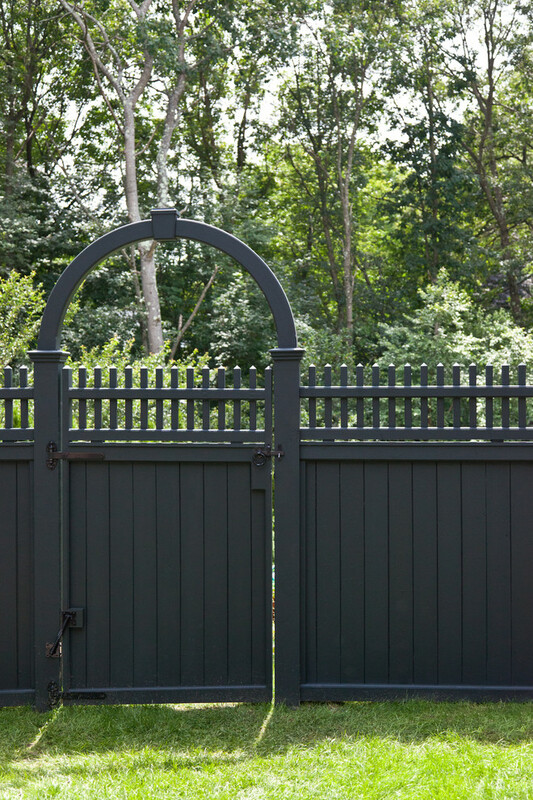 As we look, the fences has dark-toned wood front gate complete with higher wood fence posts on its left and right, displaying a contrary look to all fences. 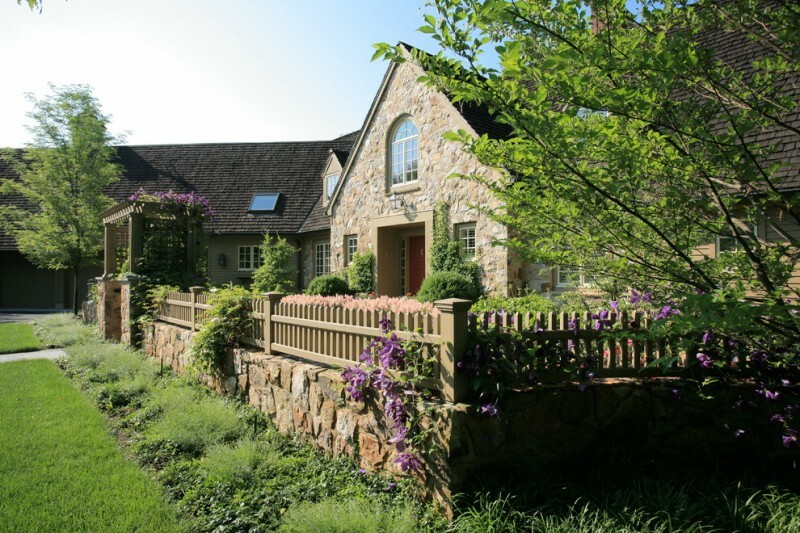 A traditional landscaping design surrounded by stone-base cedar fencing system. The look’s so classic and antique with its shabby green color as natural as the stone base. 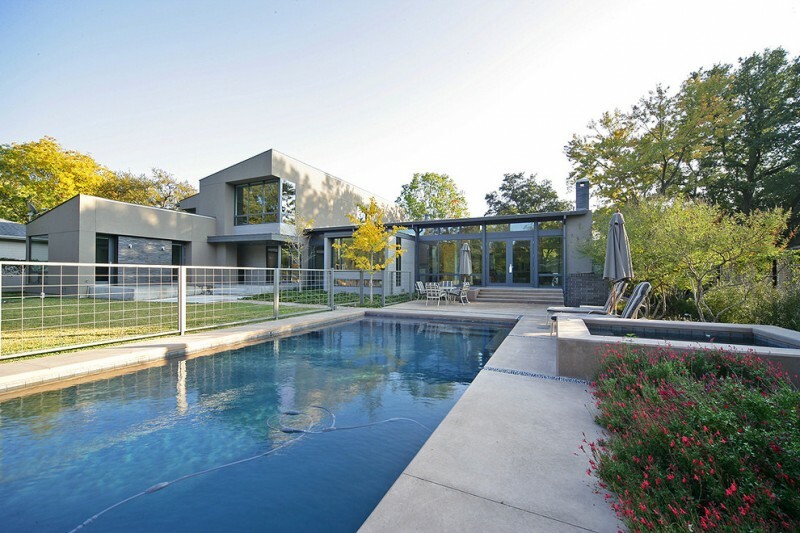 Modern & trendy fences idea separating an outdoor pool and front yard. The fences and their posts are made of best metals. They’re actually offering most updated style and modernity. 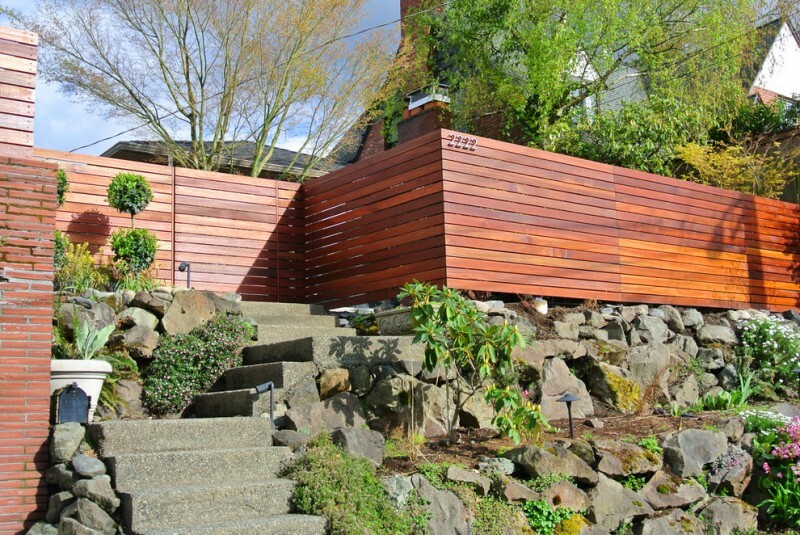 Modern wood fences with lower & upper surfaces. They look so interesting with spotlighted effect resulted from the garden light fixtures underneath the fences. You can add the front gate if you want to get proper privacy. 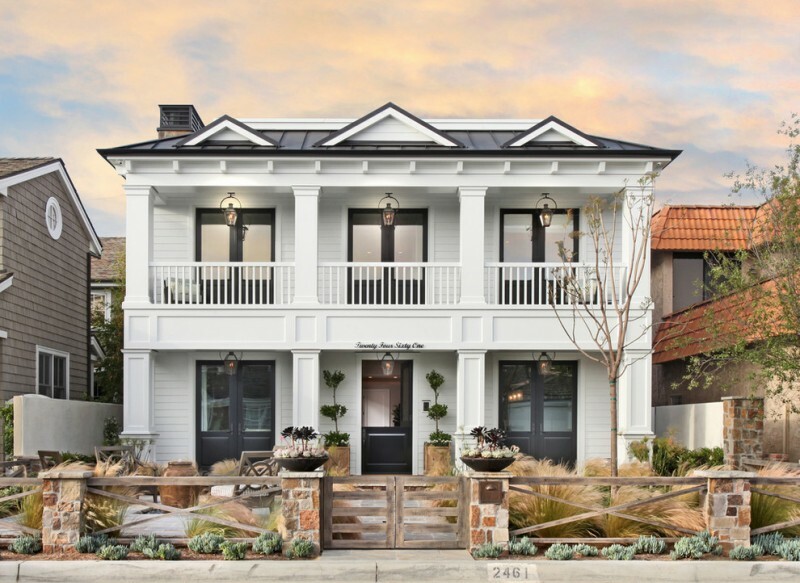 Wood fences always match white exteriors. They’re significantly contrary yet balance each other. 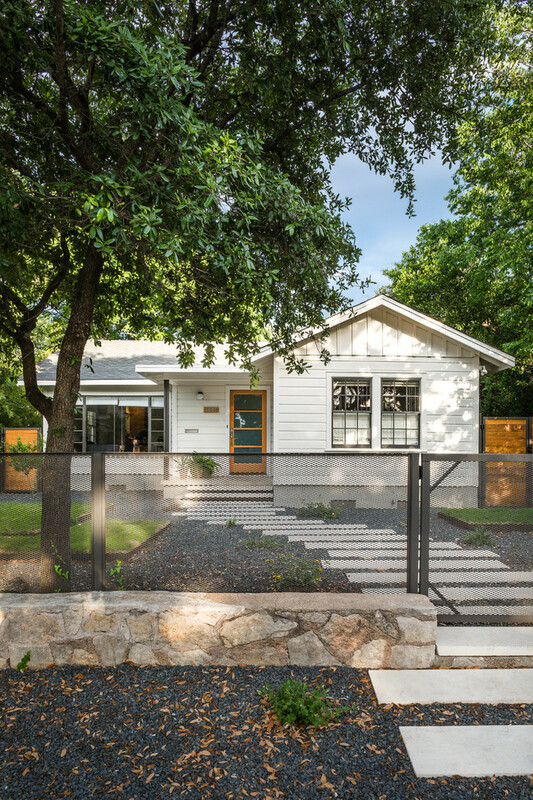 With concrete gate posts, the fences look so natural, especially when featuring this modern ranch house. Look at the fences, they’re unique and attractive. The front fences are low and taller in back. This design is created for a better security for backyard and a display exposing the front yard and genuine country style exterior. 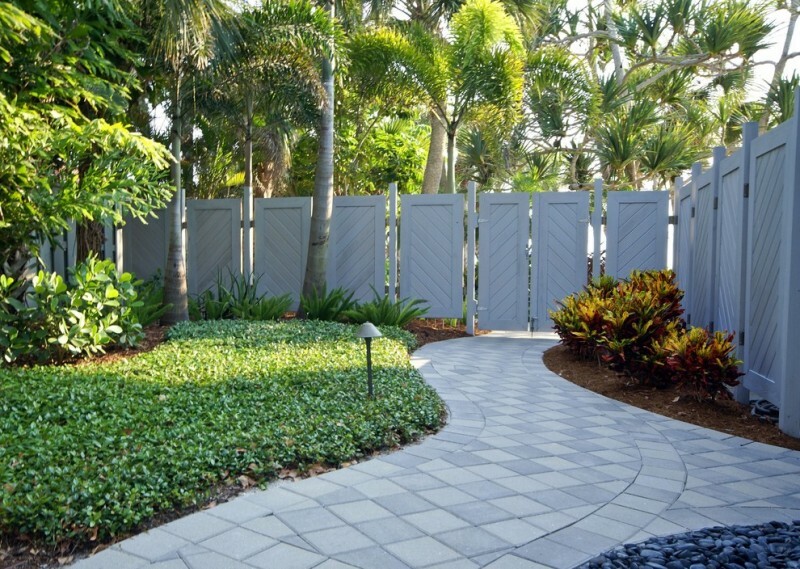 Bold grey-painted fences in modern style, the best choice for modern minimalist landscaping. Add lighting for a dramatic and warm look. Low-lighted garden lamps are quite recommended cause it perfectly blends with the fences’ color. The fence concept is to be safe for dog but still opened to front yard. The fencing system also has a header, adding style and accent as well. Too much high but good for privacy. This option obviously fits a contemporary patio with decking. 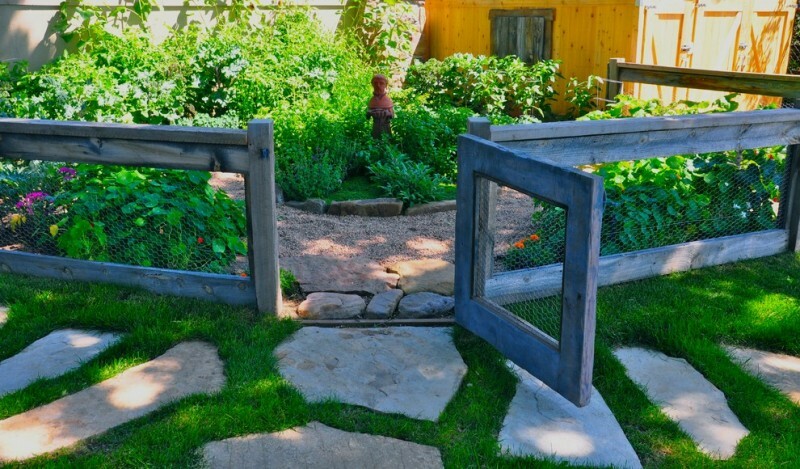 Add stone plant-beds built in front of fences, they will empowered the rustic look in this outdoor space. 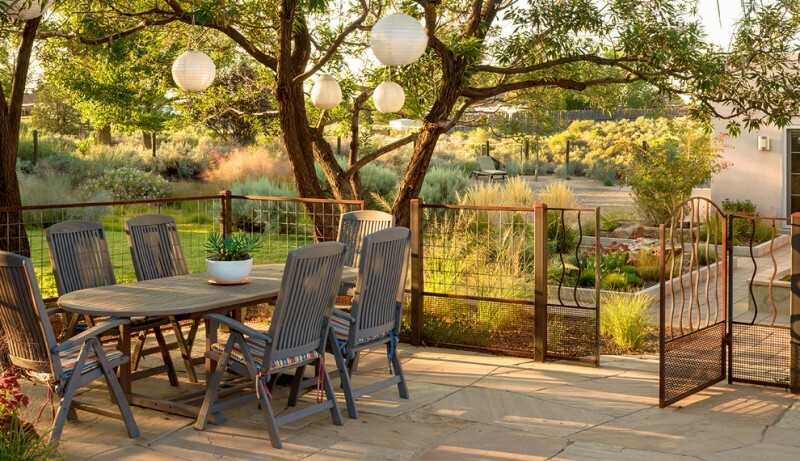 An open grid fencing system for eclectic patios. It would be good for the climbing plants. 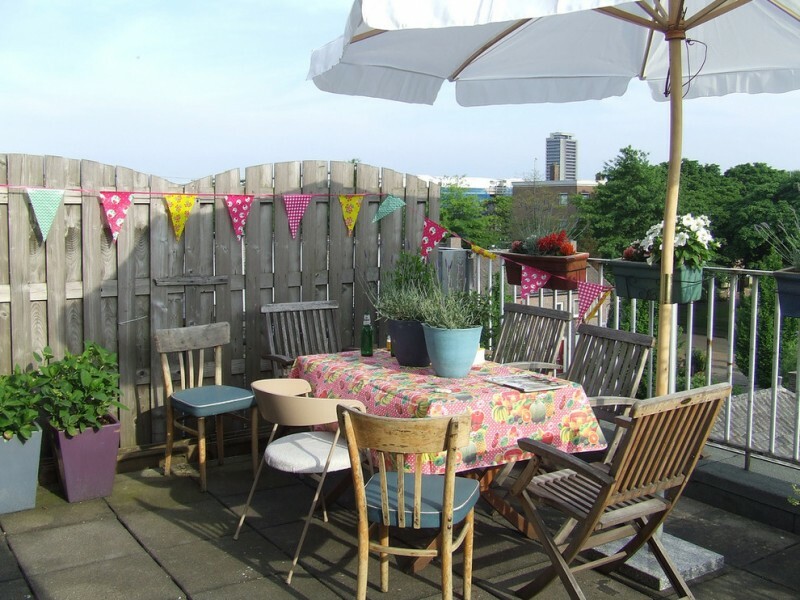 It’s recommended to adopt if you want your patio’s fences are full with fresh climbing plants. Old and shabby fencing idea for a courtyard. It clearly separates the mini garden from path. Concrete is chosen to create durable and tough fences. Climbing plants and flowers grow along the fences and top of door gate. An inspiring backyard landscaping idea for nice summer. What a lovely fence idea! It’s simple, clean, and shabby with its stained wood. Add individual step paths for a perfect finishing. 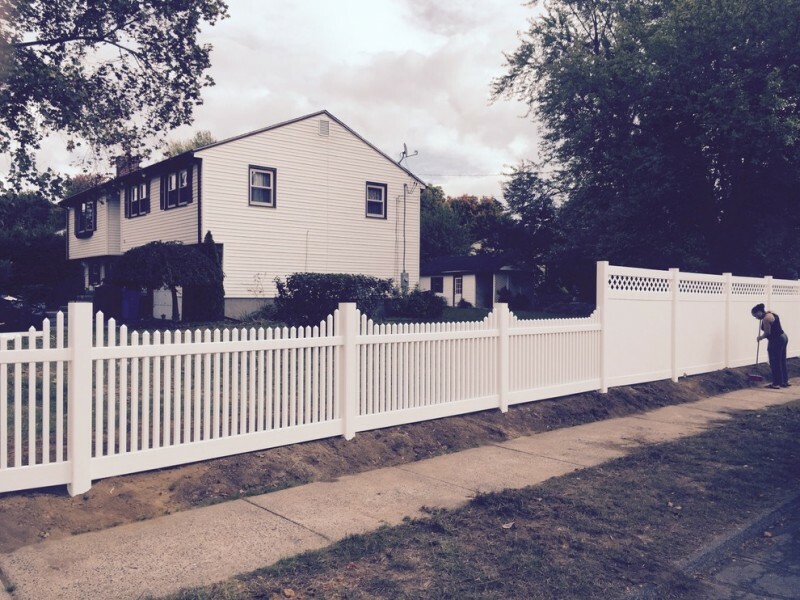 The board fencing system is better than picket fencing for a large landscape. It displays transparency, letting the whole parts of home architecture and landscape come through. Most architects say this fencing idea quite fits for a large country style house. These fences work well with the growing plants adapted in such dry area. The exterior path also brings comfy way to enter the house. 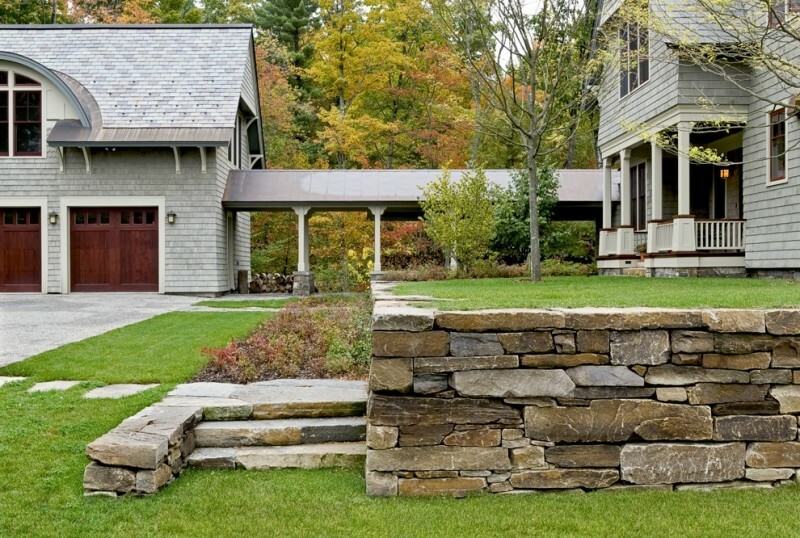 To create a dramatic rustic appeal, the homeowner selects stones for the fences’ base. Go modern for every single of landscape corners with such a modern fences. 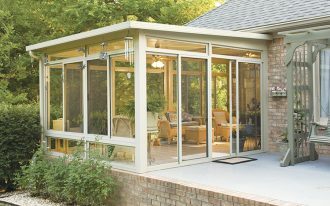 If you have a modern garden or patio, it makes sense to beautify your outdoor area with this shed. 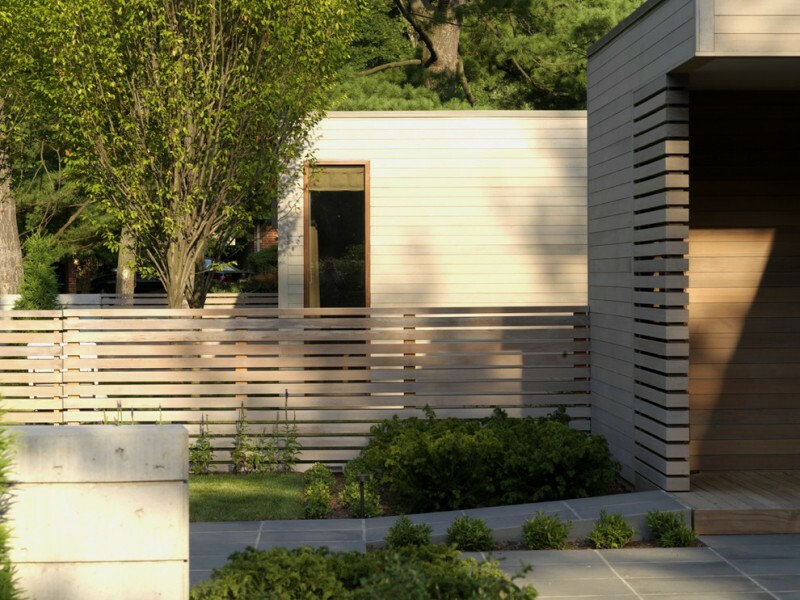 The shed is built from the slats of cedar matched with the patio furniture. Add white-painted concrete plant beds for growing your plants and put them before the fences. 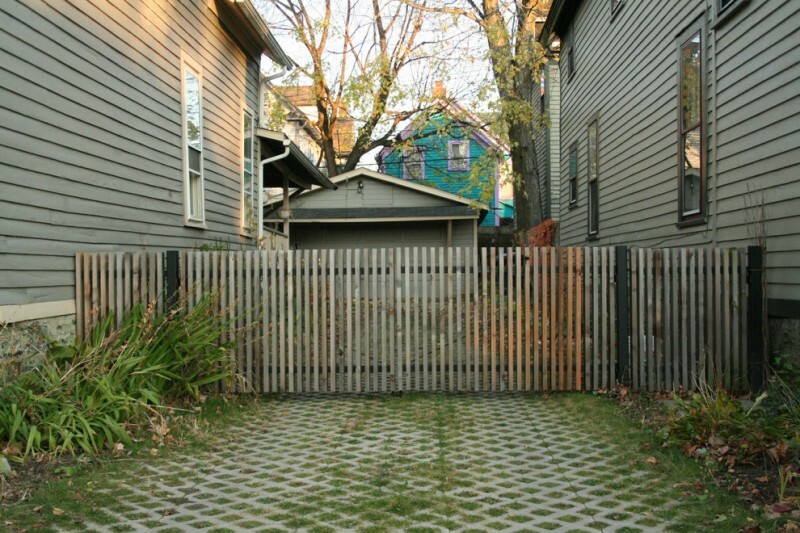 Upgrade your tired and old fences with this simple wood slats fences idea. 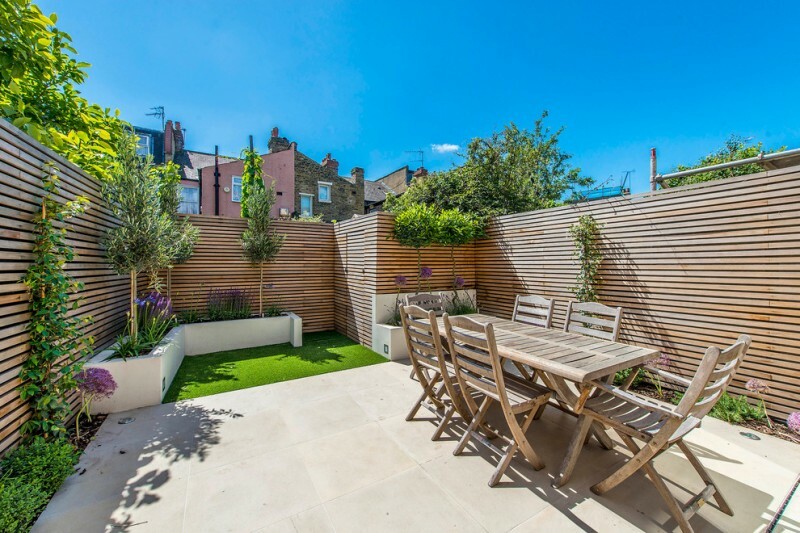 The fences are simply made of typical wood growing in nearest area, making it easier to get. 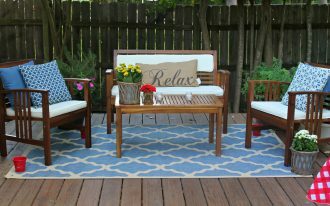 Make your new fences more stunning by featuring them with rustic outdoor furniture set and an outdoor umbrella for a shade. 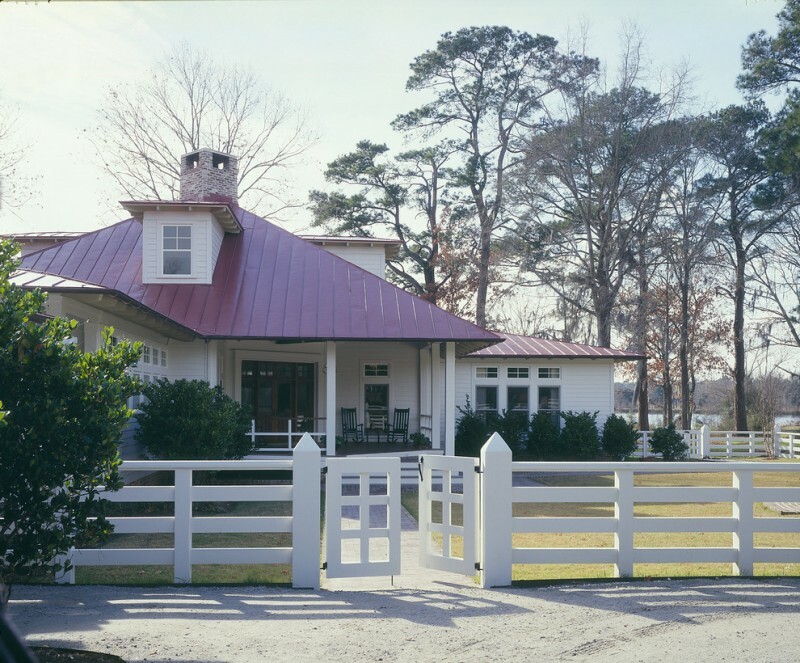 Go rustic for your exterior and landscape with this old-look metal fences. The fences are supported by solid concrete posts for connecting the door gate. They’re also inserted with lightweight metal nets for the fences’ paneling. The old look doesn’t make them out of date if they are collaborated with fresh & green plants and concrete pathway. Gothic garden idea surrounded by Gothic style fences. Gothic doesn’t have to be dark or black, or even claustrophobic. 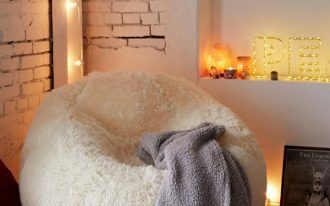 It could be airy and light. Such concept is now applied on the fences in which they are designed in thin and upright rods. This is a great fences idea. 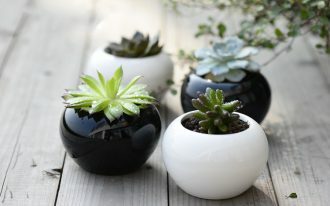 The fences seem so beautiful with clay-burnt planters complete with blossoming flowers. 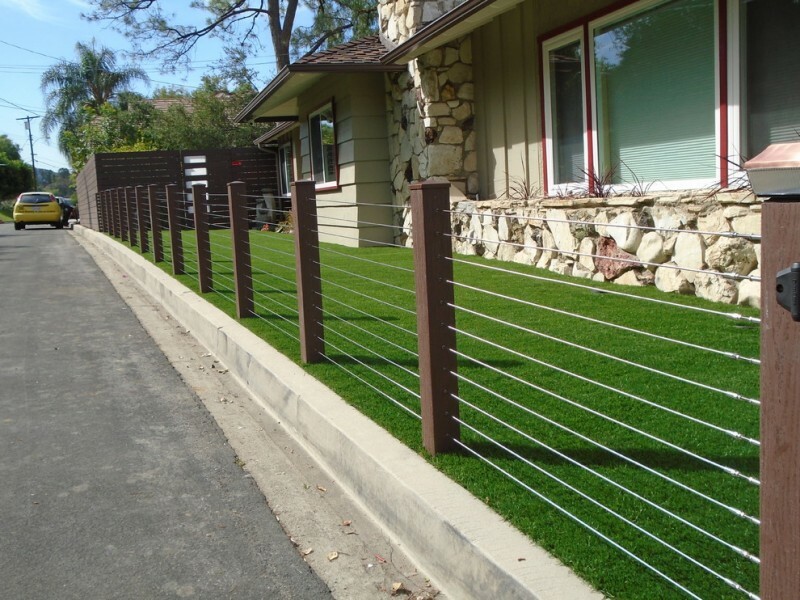 This kind of fencing system is well recommended for a modern patio with concrete floors. Elegant grey fences colored by decorative & colorful flags. Look at the seating area, it consists of different style of seats. 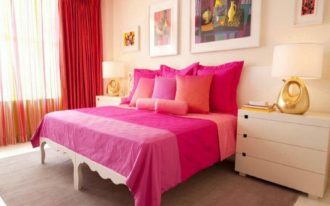 In the center, pink-covered table becomes the most striking item here. It’s called a solid fence which is made from shabby carbon steel. To make it much more tough, the fence is supported by stone fence posts. 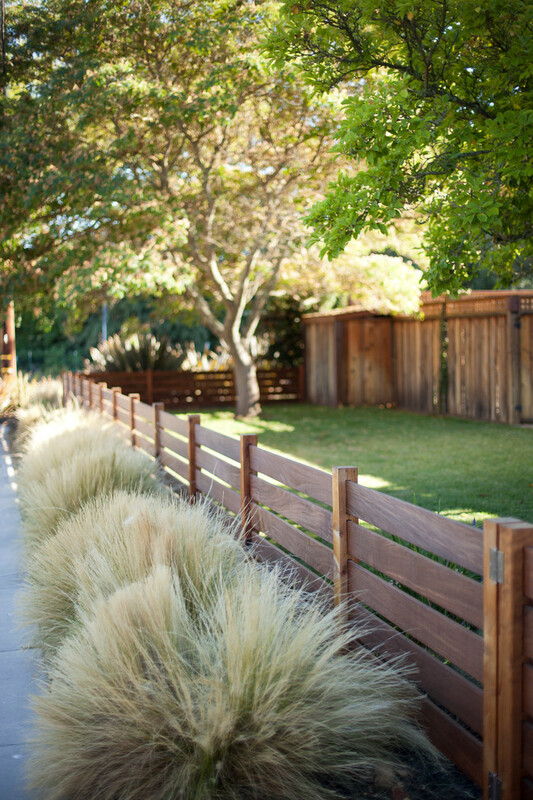 Both the fence and its posts lends rustic appeal to this landscaping wall system. Mix fences idea with different styles. 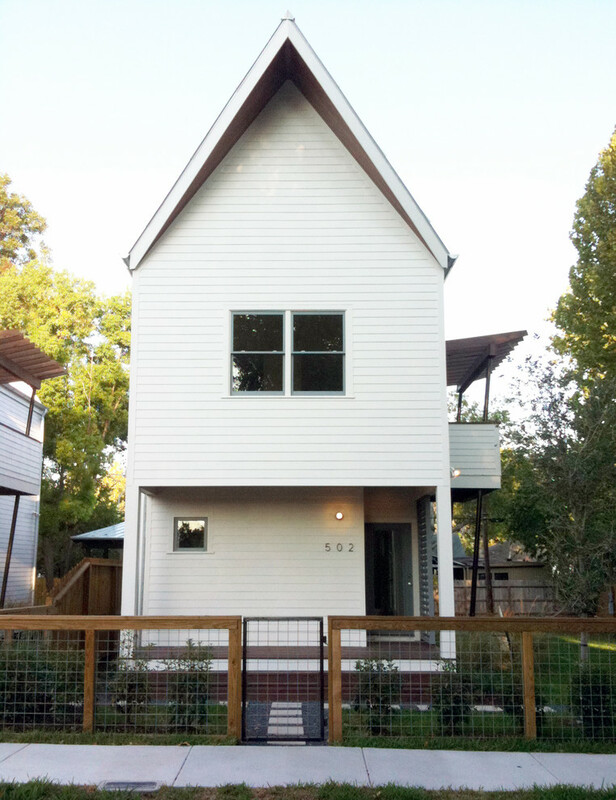 The higher one is lattice colored in white and the lower one is white wood board fence. Lattice is commonly used for more privacy, while the wood board fences tend to expose the exterior’s and landscape’s beauty. Two opposite goal but balance each other. 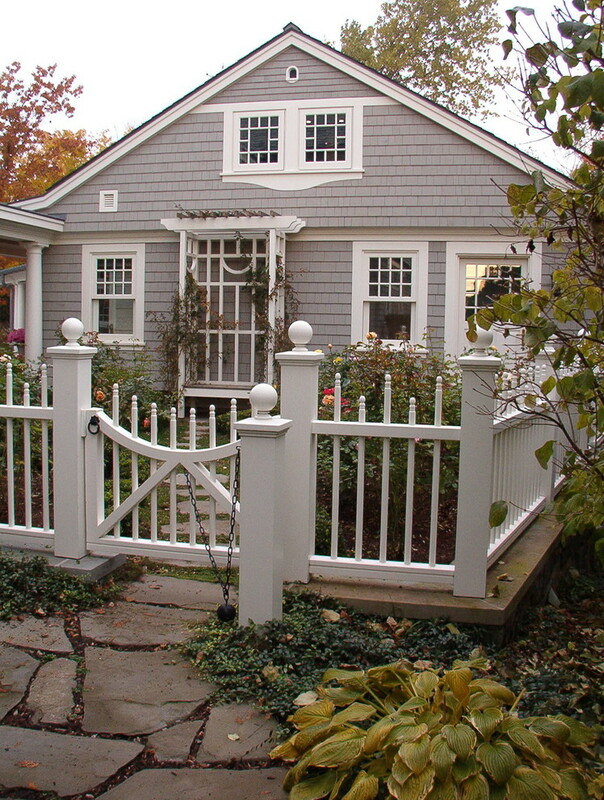 Simple and low-level picket fences have their own way to make the exterior and landscape more charming than before. Just with white finish, they look quite stylish. They let beauty of landscape and exterior to expose. 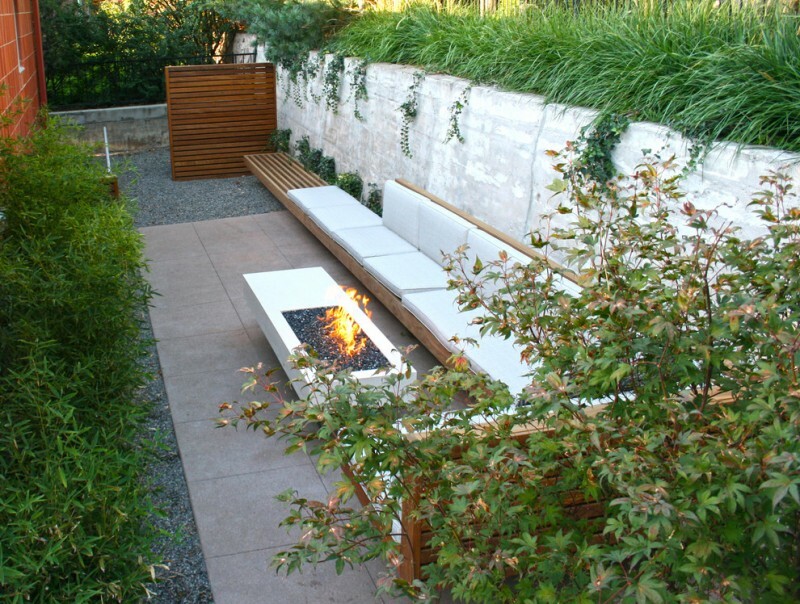 Solid concrete fencing idea integrated with modular cushions. 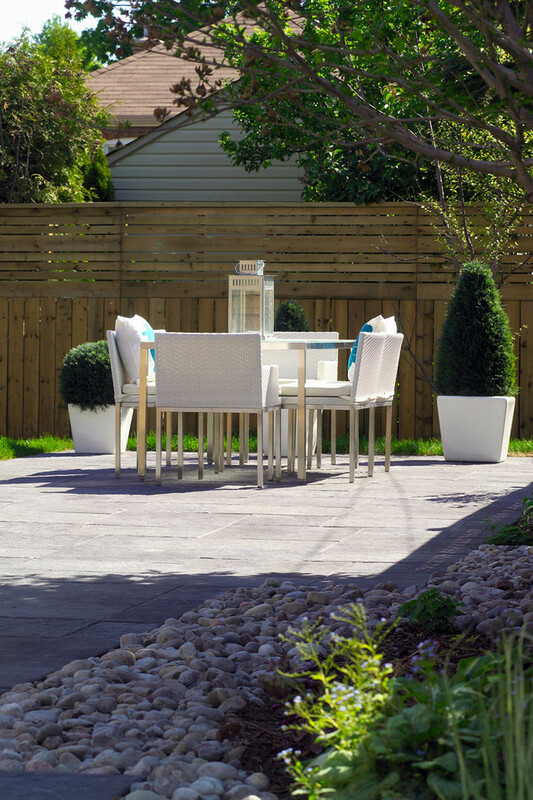 It looks great for a contemporary patio and it’s really ideal for a big party on summer. 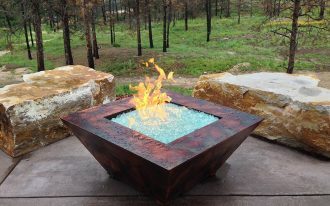 A fire pit here is able to bring warmer atmosphere at night. 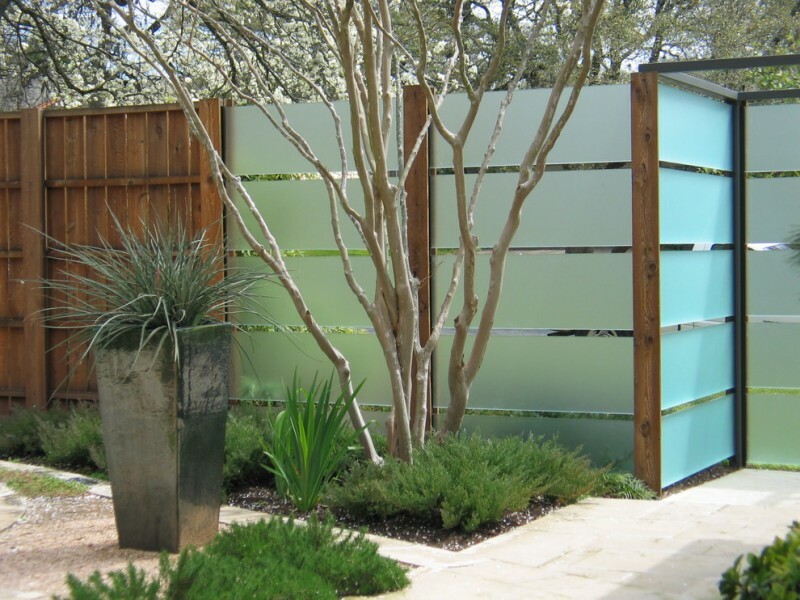 Get a modern style for your landscaping and fencing with glass slats fences idea. The material is tempered then frosted, it is installed on steel columns which are skinned by wood. 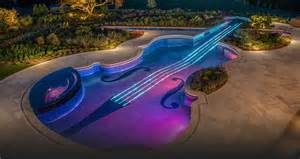 Its simple and modern design surely bring special appeal, especially for such a wonderful landscaping idea. 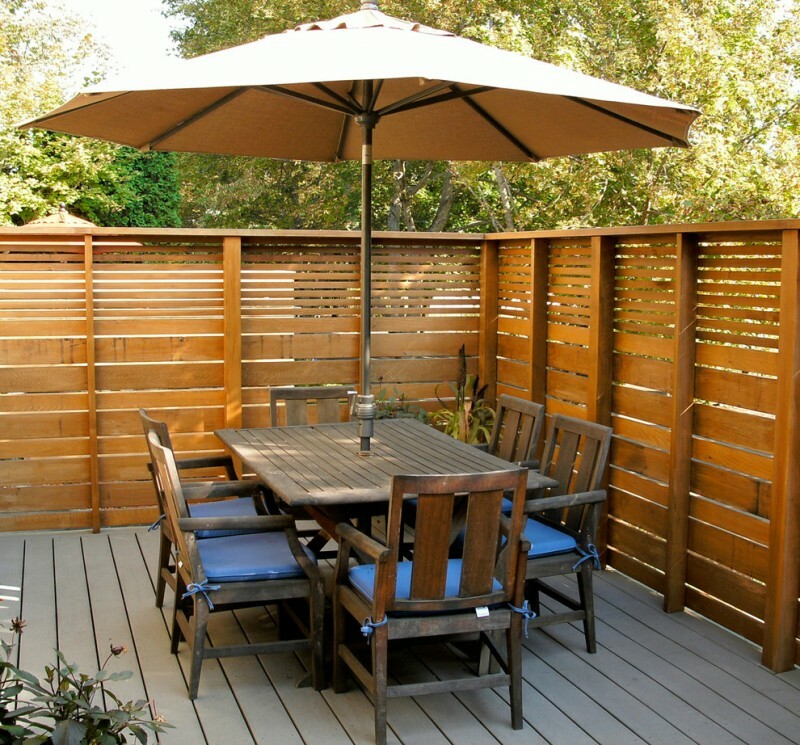 This fencing idea is built from wood slats which are installed horizontally. Each individual of slat is staggered, allowing air and light pass through. The light coming from the garden light fixture lends warm and beautiful glows. What a lovely horizontal cedar fence! 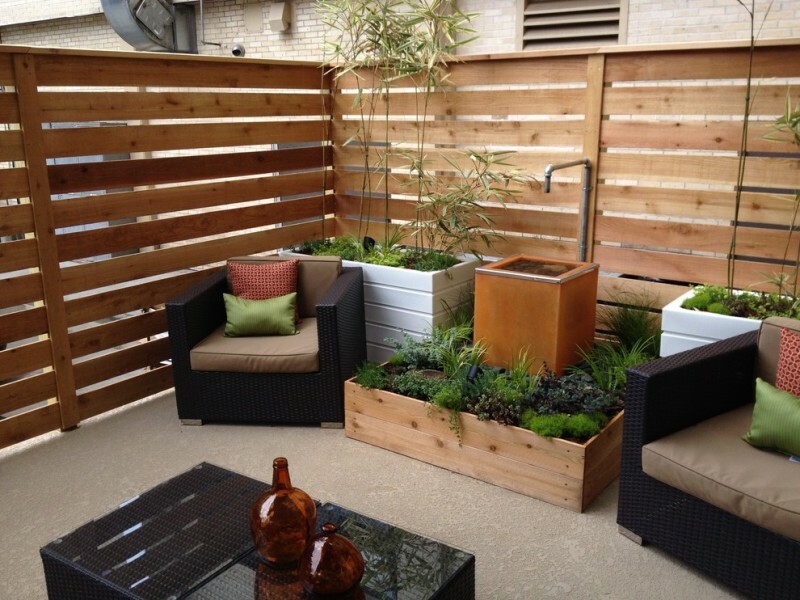 It’s simply natural and great for a small modern patio. 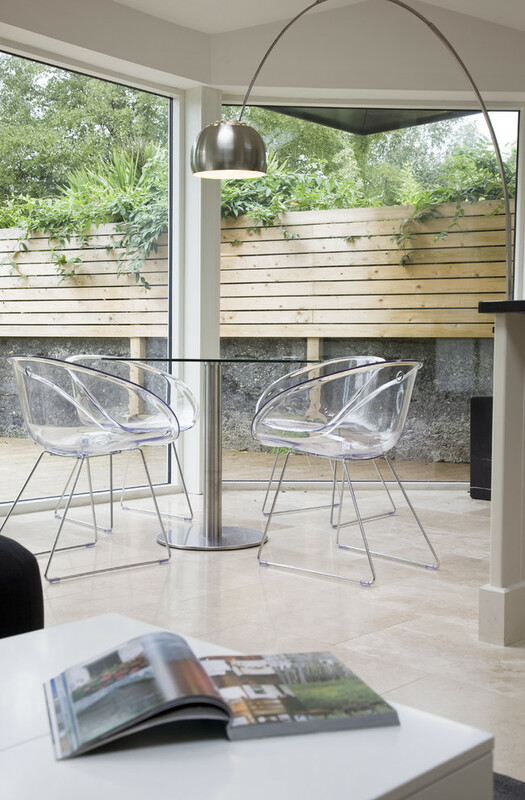 A corner modern seat isn’t enough, add a fountain and small & permanent tub for water supply & decorative feature. Trendy cedar fence idea accented by extra irons. 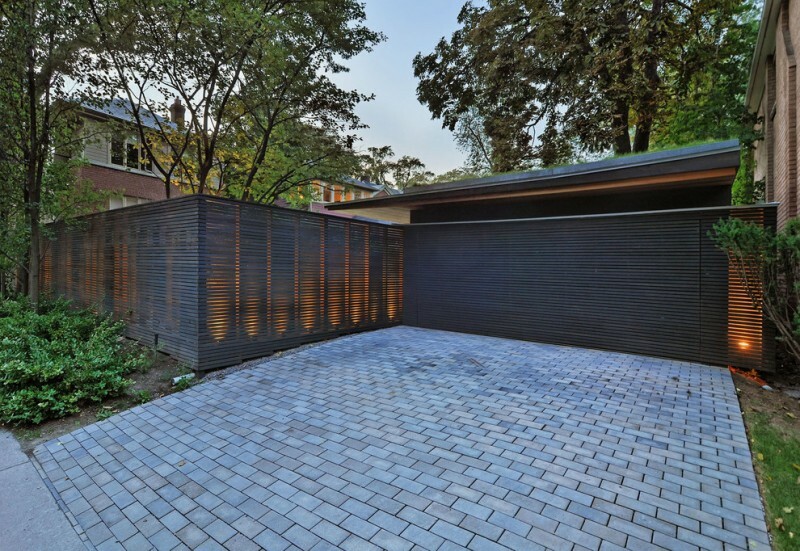 The cedar slats are horizontally installed and iron plates beautifully act as the frames. This idea exposes a great collaboration between soft & warm wood specimen and though & cold metal. Really unique and inspiring. A minimalist outdoor dining space complemented with trendy dining furniture set and stunning cedar fencing system. 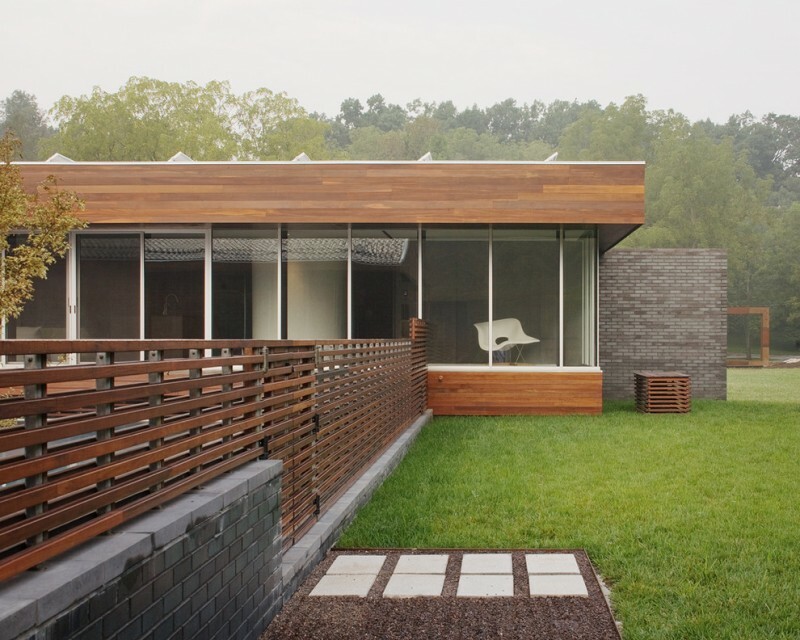 Notice the fences, you’ll discover a combination of solid concrete at bottom and horizontal cedar slats at top. Each component displays the natural character. 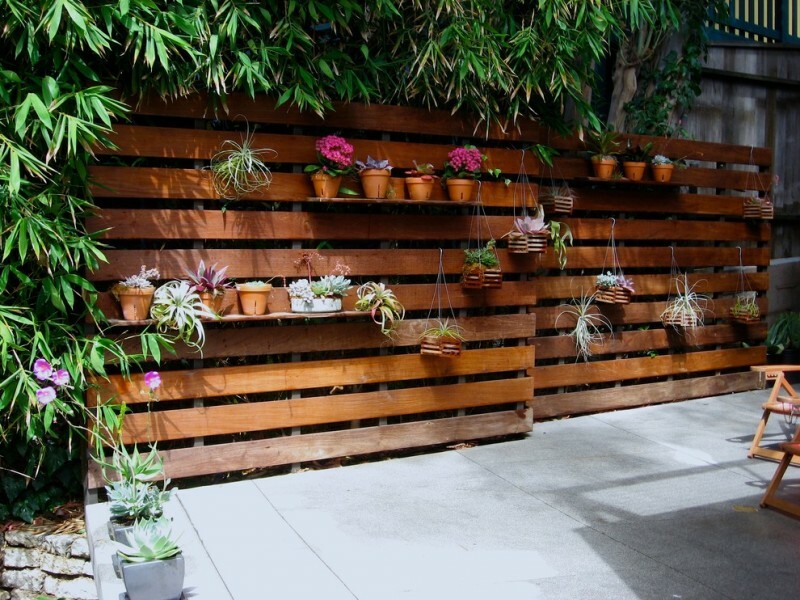 Mix vertical-horizontal fence idea made of cedar slats. Simple but nothing’s bad to apply for your patio & landscape. Different with other common cedar fences, this one has additional decorative feature as the accent. The accents are the handmade modern carvings made of wood. Go tall but keep exposing the visual interest on fences’ top. 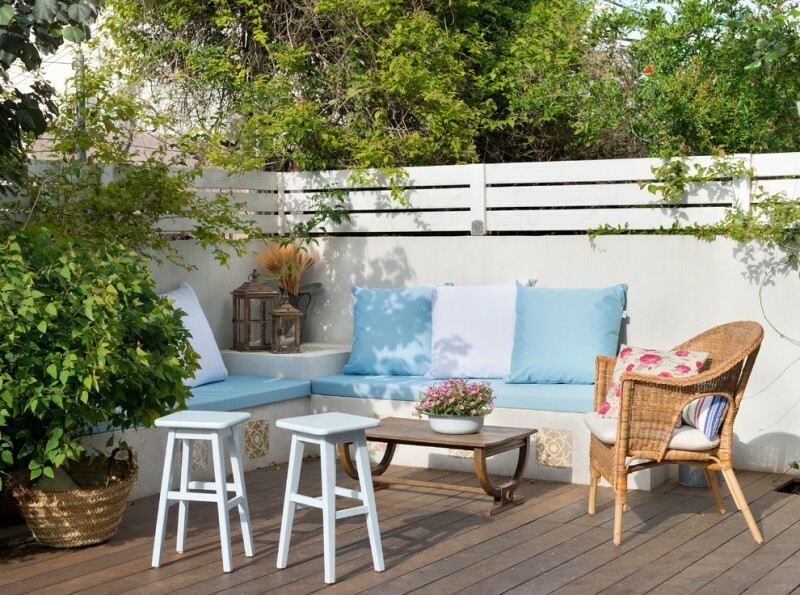 Get more stylish with such a trendy floating fence. It provides the privacy while still exhibiting the glimpses of landscape beyond. Attractively, the opposite angle of individual panel gives a visual effect of chevron motif. 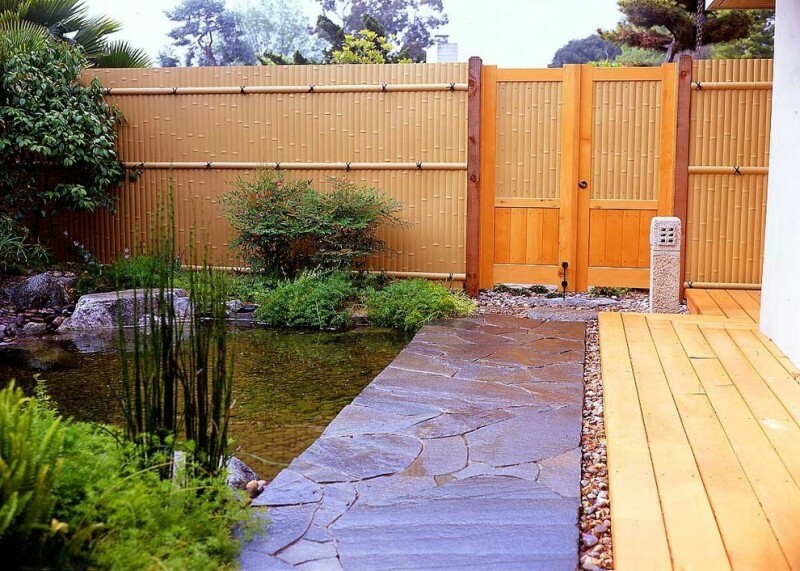 For an Asian landscaping idea, Japanese fence is well-recommended. 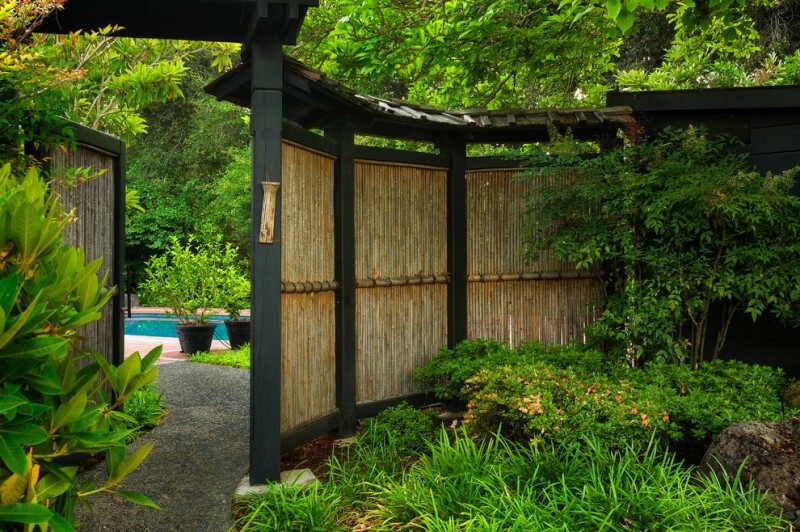 One of most inspiring Japanese fence ideas is wall bamboos with wood fence posts. It’s commonly supported with clay-burnt roofs colored in dark. 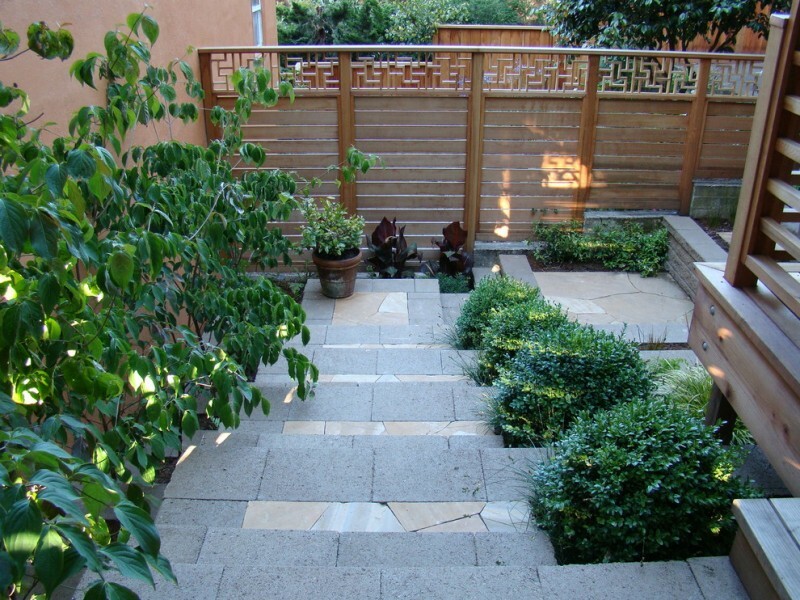 This is another inspiring Asian style landscape complete with bamboos fence. 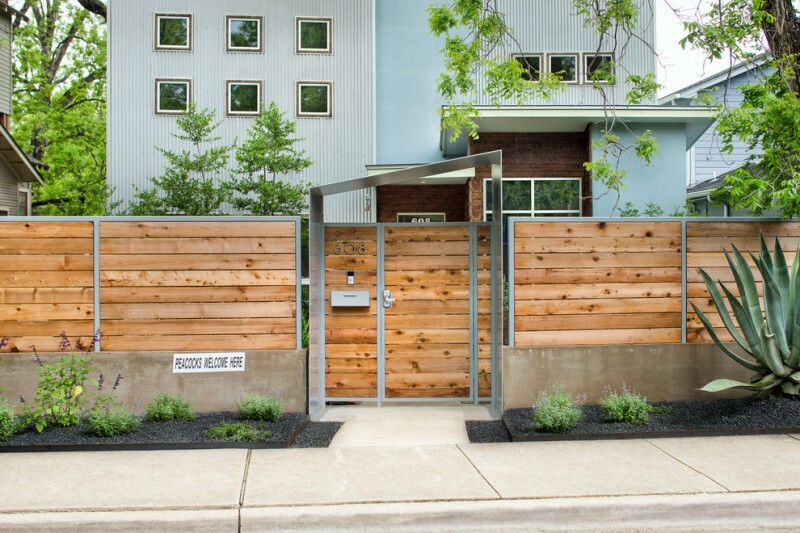 At the door gate, the homeowner adds cedar as the door trims, offering different color and texture to the fence. Contrasting rustic fence idea for a formal exterior. 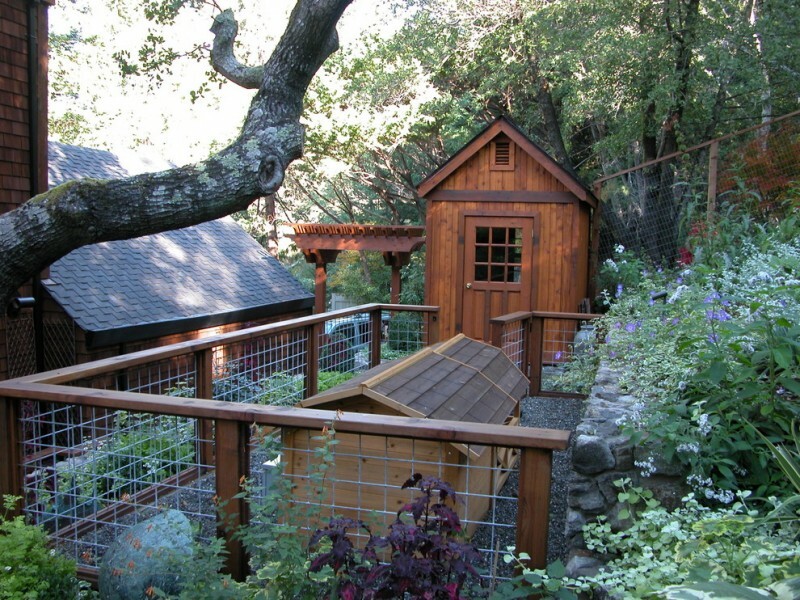 The fence is specially built for supporting rustic style landscape idea. Select this idea if you love combining two opposite things for your home. 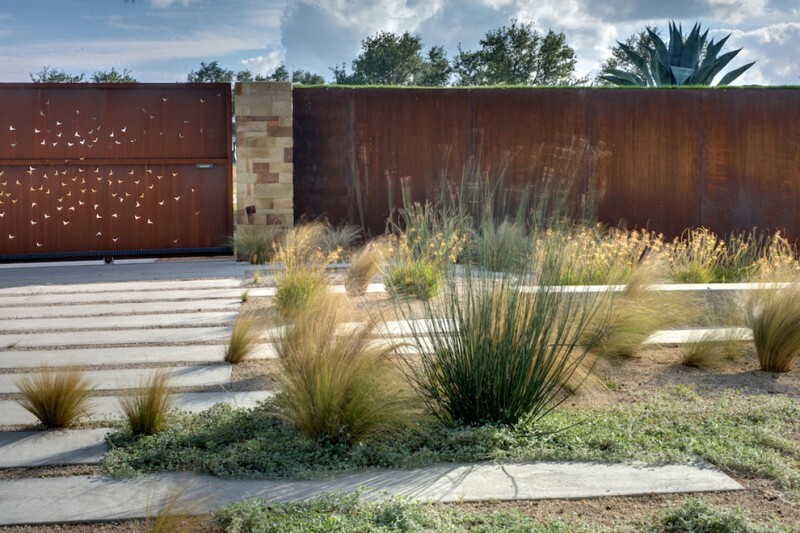 Solid concrete landscape walls featuring with old & antique iron door gate. The design obviously presents a Mediterranean concept in which it puts earthy brown color tone and shabby metal use as the priorities. 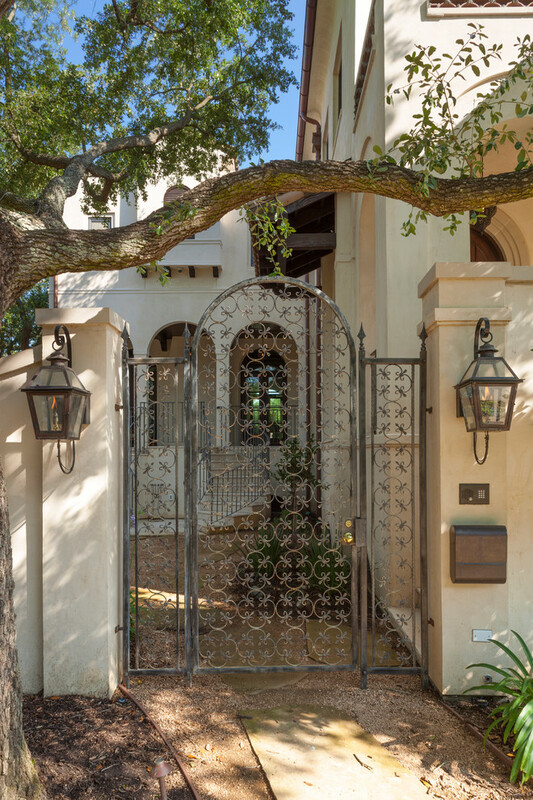 The arched-top door gate also mirrors the biggest characteristic of Mediterranean style. Feel huge comfort and privacy just with such a trendy fence design. White simply makes this patio visually large and clean. You don’t need to get worry about what furniture you should put here, white has been assisted you what the best properties for this patio. Vivid concrete fencing idea for Mediterranean landscape and exterior. An arched gate becomes the most distinctive characteristics of Mediterranean home concept and hand-carvings metal door panel complement the gate performance. Both gate and panel have a contrasting yet beautiful color tones.